I love the Food Network‘s competition shows. “Food Network Challenge“? Entertaining, but even more so when non-pros take on a challenge. “Worst Cooks in America“? I’ve only seen a few episodes, but Chef Anne’s voice is sometimes a bit too grating. That said, I have to admit that watching it makes me feel that much better about myself as a cook. “Iron Chef America“? …best show on the Food Network. Period. My favorite, by far. That said, Bobby Flay is not my favorite Iron Chef. That said, I don’t have a favorite Iron Chef. But if I did, it wouldn’t be Bobby Flay. 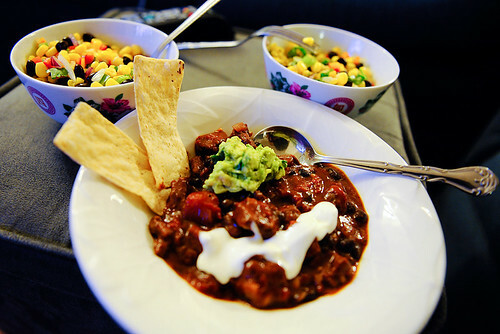 Jeff decided to make Bobby Flay’s chili recipe for our Super Bowl XLIV enjoyment, as well as some traditional corn-and-bean salad. Suffice it to say, it was delicious and boasted a deep, hearty flavor. It was also beyond my tolerance for spiciness. Admittedly, my threshold is fairly low, and Jeff claims he added only half the amount of spices in the recipe. The recipe also called for a “toasted cumin crema” and “avocado relish,” which Jeff made and said would help cool my palate after some bites of chili. Well. As a born-and-raised Texan, I don’t want any of that creamy silliness in my chili, spicy or not. So thank you, Bobby Flay, for publishing an over-spiced recipe and then having the gall to suggest that we should truss it up with creamy silliness. 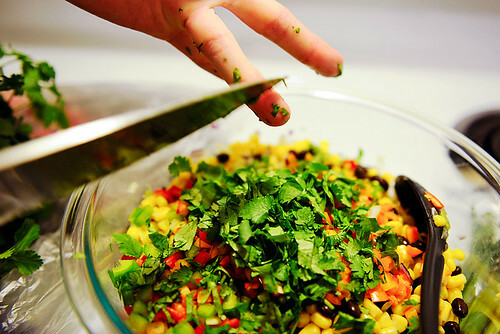 Jeff swiping cilantro off of the knife blade and into the corn-and-bean salad. 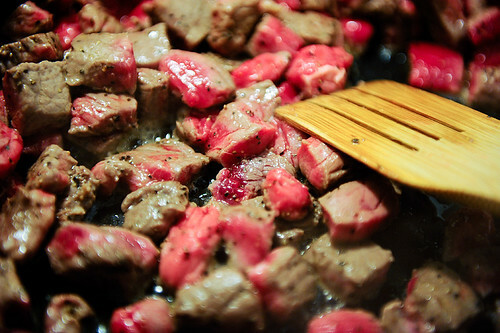 Is it weird that I think raw, red, juicy meat is so much more appetizing and aesthetically pleasing than cooked, brown meat? This is our first time making angel food cake (mixed and popped into the oven at halftime), and I have no idea why the bundt pan, after being removed from the oven, has to be placed upside down on a glass bottle. Chopped is nowhere near the show that Top Chef is. Also, I realize that Bizarre Foods is not a competition, but it is by far my favorite show on the network. 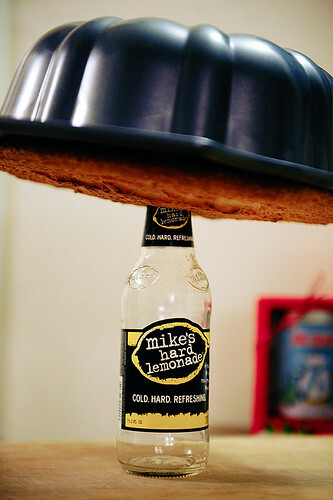 Chris, I am obsessed with beautiful photographs of tantalizing food, and right now I’m about to lick my computer screen. (I like not-so-beautiful photographs of tantalizing food, too, because I like food THAT MUCH, but your photos are definitely good!) Yum.